Highway 10, on the road to New Orleans, and it’s almost midnight. We have no idea where we’re sleeping tonight; maybe a campground, maybe a rest stop; perhaps there’ll be no sleep at all. Van living is a tough life, and Texas spared no punches. In Huntsville we camp for the night and see an eight-foot alligator, night-stalk an armadillo, and battle with ants. In Austin we set up shop on a street corner fair. “Circus Food,” Bob calls it. A flash rain storm makes us happy to have our umbrella. Everything gets wet. I go out to an open mic night I saw in the paper. Seven people are there, an eclectic group, when I read my chapter from the book. Thirty minutes later there’s thirty. No sales. Back at the Circus: “Bob, Nick. You sell anything?” They’ve made a carny friend. She gives them funnel cake and beer. “Maybe three copies.” We make a few more sales, shut down, and hit the road. In Dallas we roam Main Street until well after last call at the bars. It’s hot and we sleep in an empty parking lot downtown. I lie on the floor and fight Bob for leg room. Scratching my sweaty hide reminds me of heat sleep in Iraq, reminds me of the austerities of being on a mission. “No,” he says, “Gulf War.” His fat kid steps outside in only his underwear and stares at us. We find a rusty razor blade and a screwdriver bit in the bed. The headboard falls off the wall the moment we touch it. The place is a flophouse. I plant myself in front of the laptop, drink beer, and catch up on business while Bob and Nick hit the bars. We haven’t really eaten all day and when they come back at 2:00 we’re all hungry. I’m resolved to a “beer dinner” but Bob remembers the pasta in the Van. We cook it up in his fuel stove in the hotel room and wash the dishes in the shower. Van life. At a small bookstore in Houston I chat with the nice lady who runs the store and pick up a copy of Toqueville’s Democracy in America. Sales for the day are low, but the first book sold is to a friend from the Army who makes a special point of driving out to see us, buys the book, and invites us to a fajita dinner. Delicious meal, my friend, and good war stories. And then it’s back on the road. Driving away from Phoenix, on the road to Austin, and it’s my turn to rest in the back seat. Except it’s time for business, never enough time for business. I thought writing the book would be the hard part. Stage One. No way. Then I had to self-publish my manuscript. Production, with its myriad and intricate processes, collaborations, trusts, and curses. Stage Two. Now I have to sell the damn thing, I have to sell myself, and that’s something else entirely. Stage Three. So I find myself driving across country in a passenger van, a rock solid E-150, an American vehicle. I’ve taken out all but four seats, loaded her down with enough gear to live out of for two months, and piled the back cargo space high with boxes of books (1,300, to be precise). 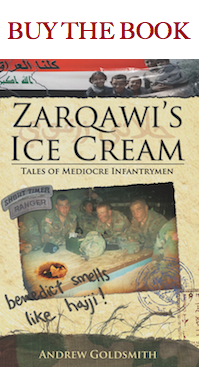 I’m with my hometown friend Nick and my war buddy (and character in the book Zarqawi’s Ice Cream: Tales of Mediocre Infantrymen) Bob. Phoenix is done and past. It was a little rough, but I think we’ve all learned a lot. Bob learned that learning to ride a skateboard can be rough. Skating down some smooth city streets, he quickly gained speed, attempted to bail and run out his speed, and ended up crashing to the concrete and rolling to his feet. Doctor Nick and Medic Goldsmith quickly diagnosed a dislocated or separated shoulder. Back at home base, we Googled how to fix a dislocated collarbone and quickly set to work. Check out the footage in the videos section of the website. We would later learn that our methods to manually relocate Bob’s shoulder were not in vain. At the VA hospital the doctors said the shoulder had indeed been dislocated and put back into place, and that it remained separated. Bob will be fine in a week or two, he’s a soldier and he’s tough, but until then he’ll be sporting a sling. I’ve been reminded that there must be limits. We are not invincible, and there will be casualties. There will be highs and there will be lows. Like any good mission, there will be sacrifices. Veteran Van is a pretty audacious caper. Normal people don’t write, self-publish a book, and drive ten thousand miles across country in a van to promote it. . . I went to grade school safe and confident in Empire America, the country who fought the good fight, who fought it valiantly, and rested confidently assured in perpetual and gentlemanly victory. Now it seems as if all is lost. We’re sunk in recession and mired in global conflict. China is set to surpass us soon as the global economic and political powerhouse of the century. My friends from high school with college degrees (and college debt) are bussing tables and living with Mom. But it doesn’t have to be that way. Sometimes we have to let go of doubt and fear and luxury and embrace the struggle. Sometimes we have to be weird and spontaneous and irrational and just a little bit monster. Sometimes you just have to hop in the van and ride. I was in Iraq, never in Afghanistan, and any links to Iraq and bin Laden are pretty sketchy. Despite this, many of my friends and I’m guessing a good part of the American people, through a mixture of ignorance, folk wisdom, lazy thinking, and government and media propaganda, think things like Iraq, Afghanistan, and Osama bin Laden are simply one and the same. And in a way they are. Since 9/11 almost ten years ago, our country has engaged in the War on Terrorism, whose jurisdiction does certainly cover Iraq and bin Laden. I remember that day clearly. I woke up around seven and groggily met my dad in the kitchen, where he was every morning making coffee and toast. He was watching the TV silently; I looked at it too, and saw a plane smash into a huge building. I was sixteen and saw the terrorist attacks of 9/11 as something very intriguing. I couldn’t believe the bastards had the balls to do something like this. “Don’t they know that we’re America, what we’re going to do now?” I instantly knew big changes were coming. I knew America was going to go to war and crush whoever did this. I grew up in the ’80s and early ’90s; I was taught that America is an enlightened superpower, that we would be an industrial and democratic powerhouse for centuries, the New Rome. 9/11 made me bloodthirsty. I, like almost every American, wanted bin Laden’s head, and I wanted it now. Three years later, I was still somewhat bloodthirsty, eager to go to War. I joined the Army and went to Iraq. Now bin Laden is dead, but it’s not as satisfying as I might have hoped. It’s been almost ten years since 9/11 and a lot has changed in America. My classmates who saw the towers fall with me haven’t joined a vibrant powerhouse economy; they’re waiters and temp workers with bachelor’s degrees not worth the paper they’re printed on. Not even Americans believe we own the new century, as China and other world powers are steadily gaining prominence in world affairs. The apathy and disconnect most Americans express for the War on Terrorism is scary. Percentage-wise, very few Americans are actively connected to this war, and the all-volunteer army ensures that many privledged classes are virtually untouched by combat losses. I joined the Army partly because I thought that my service now may prevent my little brother (who is ten years younger than me) from himself having to suffer and bleed in a foreign country. He’s sixteen now, and there is plenty of war to go around. So, am I happy that bin Laden’s dead? I guess, sure. But does it mean anything? The man himself probably hasn’t contributed anything to his cause. For the last ten years he’s been a living martyr and fugitive. Knowing as little as I do about geo-politics, just using my soldier’s sense, I’d say that on the balance sheet, killing bin Laden will add up to zero. It’s a useful media stunt, it’ll be on the front pages of the news mags for the next week or two, but after that, business as usual. The decay of the American superpower and the seemingly insolvable insurgency in Afghanistan are the most important legacies of bin Laden. Killing him is great, but we need to fearlessly address not only the man, but his effects, and most importantly, what’s he’s done to us, what we’ve become.